Renesas presents the µPD720230, the first USB 3.0 to SATA 6Gbps bridge SoC with high-speed UASP protocol support. Renesas Electronics Corporation (TSE:6723), a premier provider of advanced semiconductor solutions, today announced the availability of its new SuperSpeed Universal Serial Bus (USB 3.0) SATA3 bridge system-on-chip ([SoC], part number µPD720230) that enables data transfer between a USB 3.0 host system and a Serial ATA (SATA) device in external USB storage equipment (see Note 1). The new SoC is the world's first USB 3.0 bridge SoC that supports the UASP (USB Attached SCSI Protocol), significantly speeding up data throughput for large volumes of data. USB 3.0 achieves data transfer speeds more than 10 times faster than the previous version of the standard, USB 2.0—currently the mainstream data transfer technology, and therefore easily supports the growing need for increased data-recording media capacities. Renesas has led the industry by releasing the µPD720200 USB 3.0 host controller in May 2009 and began mass production in June that same year. Since then, the company’s lineup of USB 3.0 host controllers has been adopted by customers worldwide. Total shipments of these products already have exceeded 40 million units since May 2010, and Renesas has ramped up production of its USB 3.0 host controllers to 6 million units per month. During this period, the company also released in December 2009 a UASP driver that achieves high-speed data transfers for storage devices by improving the performance limit of the BOT (Bulk-Only Transfer) standard used by USB 2.0, making it possible for external storage devices to take advantage of the increased speed offered by the new USB 3.0 standard. 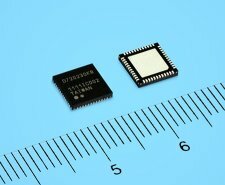 To respond to the need for even faster data transfer performance necessary with the increased scale of the data handled in the storage device market, Renesas has released the µPD720230 bridge SoC. This device, combined with Renesas’ advanced host-controller technology and UASP driver software, achieves industry-leading data transfer performance. In addition to Renesas’ USB 3.0 host controllers, the UASP driver operates with AMD’s A70M and A75 chipsets, made possible through close cooperation with AMD. Renesas also plans on achieving compatibility with AMD’s future USB3-supporting chipsets. The new µPD720230 USB 3.0-SATA3 bridge SoC supports SuperSpeed USB transfer speeds of up to 5 gigabits per second (Gbps)—as well as the SATA Revision 3.0 6-Gbps bit rate achieving maximum data transfer performance of USB 3.0. In addition to the BOT standard for mass storage devices using USB 2.0, the new SoC also supports the UASP protocol standardized in USB 3.0 for improving the performance limits of the BOT standard. When connected to an SSD that supports 6-Gbps SATA3, the µPD720230 device achieves data transfer performance in excess of 370 MB/s in UASP mode as verified by the ATTO Disk Benchmark, version 2.46. The µPD720230 USB 3.0-SATA3 SoC is provided in a 48-pin QFN package, incorporates a voltage regulator, and also supports bus power modes, which contribute to miniaturization of the end products. Although only two states, the U0 normal state and the U3 suspend state were stipulated in the USB 2.0 standard, the USB 3.0 standard also stipulates the U1 and U2 power states to provide even finer-grained suppression of power consumption. The new USB 3.0-SATA3 SoC reduces overall power consumption by approximately 40 percent (when the system is in idle state) via the new USB 3.0 U1 and U2 power states, as compared to when stipulating only the U0 and U3 power states..
Additionally, the USB 3.0 is capable of supporting data transfer rates of up to 5 Gbps, which is 10 times faster than the previous USB 2.0 transfer speeds. Therefore, the USB 3.0 can reduce the data transferring time to 10 percent from that of the USB 2.0 and automatically extends the idle time. As a result, by stipulating the U1 and U2 power states, the new SoC realizes even more power conservation. Renesas’ UASP driver runs not only on the Renesas µPD720200 USB 3.0 host controller and its follow-on products—the µPD720200A, µPD720201 and µPD720202—but also on AMD’s A70M and A75 chipsets based on a cooperative agreement with AMD, as well as other companies’ chipsets. In addition, Renesas also plans on achieving compatibility with future AMD USB3-supporting chipsets with this driver. A license of Renesas’ UASP driver is included with the company’s µPD720230 USB 3.0 to SATA3 bridge SoC and is available for license to other SATA bridge manufacturers. Renesas has already concluded a licensing agreement with Japanese LSI supplier Media Logic. More information for the specifications of Renesas’ µPD720230 USB 3.0-SATA3 SoC can be found at http://am.renesas.com/press/news/2011/news20110830_s.jsp.